Please download the SI Play app to follow your child's team. Schedules can be easily followed on the Si Play app. Send Si Play support a request if you are unable to see your child's team. When setting up your family account please do not request password. Password request will only work if you already have created an Si Play family account on this site. Unfortunately, the site considers you a new member. If you have any comments and/or questions please send email to cnsfboard@gmail.com. Pictures for Colts Neck Journal should be sent to cnsfpictures@gmail.com. Submission to Colts Neck Journal is the 15th of every month. Want to get involved in tennis? Here's your chance! 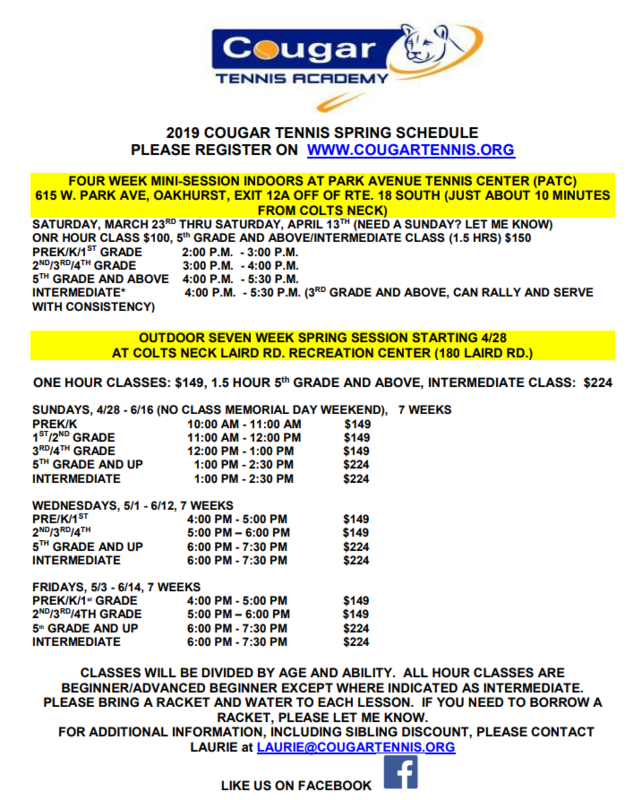 Click here to see the below PDF and go to www.cougartennis.org to learn more and register! Any questions? Need a sibling discount? Email laurie@cougartennis.org for help!